The scenic Mississippi River that flows through and around the Mississippi Golf Club serves as a backdrop to the century old trees and manicured gardens, making it one of the most picturesque and enjoyable golf courses in the Ottawa area. 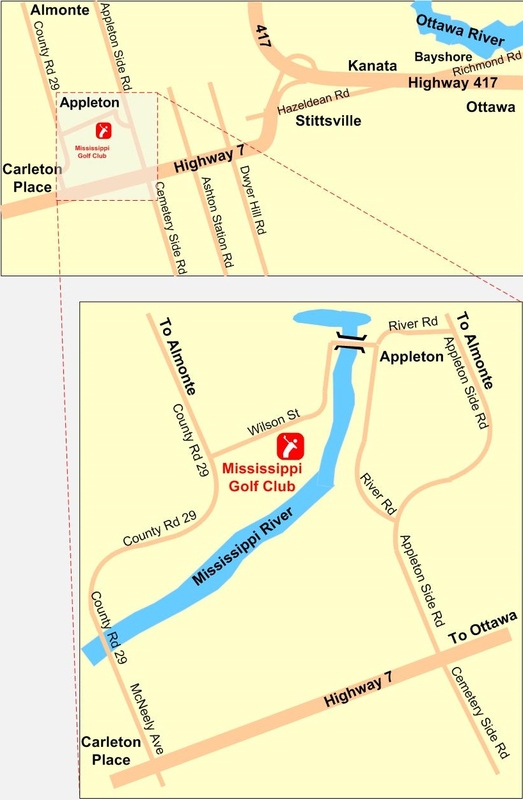 The course is situated in the quaint village of Appleton, just a short drive west from Kanata on the 4-lane Highway 7. This historic, natural layout offers numerous risk/reward opportunities, allowing the course to be as challenging, or as benign, as the player desires. We offer great playing conditions, including lush fairways and pristine greens, all at reasonable costs for either members or green fee players. Our practice range, short game area and PGA of Canada teaching professionals will meet the needs of players at all levels. Our full modern clubhouse includes a new bar, large dining room and new 2000 sq. ft. patio area overlooking the scenic 18th green and Mississippi River to enhance the golfing experience. Our new fully automated irrigation system further ensures our superior playing conditions. Flagstick Magazine's 2017 Readers Choice Awards recognized the Mississippi Golf Club as the #1 Most Underrated Golf Course and among the top 4 for Best Overall Conditioning in the Eastern Ontario and Western Quebec region. As a member-owned, semi-private club, we offer a number of membership packages with excellent benefits, all with extremely reasonable fees, to meet a variety of member needs. For 2019, we have enhanced our Limited Member category from 5-day afternoons to 7-day afternoons. To encourage the growth of the game, we have also drastically reduced our Junior Member fees to $199 per year. In addition, if a new junior member joins with a parent or grandparent who is also joining as a new full single member, the first-year junior fee is waived. For more information on our Junior Program, follow this link. We also welcome our green fee player customers with reasonable rates for such a superior facility. The Mississippi Golf Club is a financially stable not-for-profit corporation owned and operated by our members. All decisions are made by the members or their elected Board of Directors. There are no third-parties involved in deciding the activities or the future of the Club. Beautiful scenery, friendly, welcoming people and exceptionally well-maintained facilities make the Mississippi Golf Club one of the most pleasant and rewarding golf experiences in the Ottawa area. Come and join us for a round! Just 17 Minutes from Kanata! For course reviews, driving directions and more maps, click here.